Taylor Land and Nepal. Photos: ©FlyingHorsePhotography. Mill Spring, NC – June 3, 2016 – Taylor Land of Atlanta, GA and Nepal collected a first place finish in the $25,000 Under 25 Grand Prix at Tryon International Equestrian Center (TIEC), completing the jump-off in 40.795 seconds for the win. Luis Larrazabal of Wellington, FL finished in second place aboard Quintus Fabius, crossing through the timers in 41.623 seconds, while Bryn Sadler of Santa Fe, NM and Cezarro earned third with a time of 42.012 seconds. Competition at Tryon Spring 7 continues Saturday with the $130,000 Ariat® Grand Prix CSI 3*. Gates open at 6:00 p.m. and the class is set to start at 8:00 p.m.
Land and Nepal, a 2002 Argentine gelding (G.S. Raimundo x Rye Grass Finest RP H-31) owned by Jay Land, went early in the order, entering the ring as the third pair to test the track set by Michel Vaillancourt (CAN). Land and Nepal led with a clean effort on the first round track, moving them forward to the jump-off round. Brittni Raflowitz, of Palm City, FL and Baloumina Du Ry, followed after Land, also securing a place in the jump-off and ultimately finishing in fourth. The duo rode a crisp first round, which demanded technical attention and skill, as it included several tight turns and two forward combinations. According to Land, Nepal has made great strides since her family bought him as a young horse, and he has steadily made his way through the ranks with several members of the Land family. This is the duo’s top finish to date at TIEC this season and Land was pleased with their rides in both rounds, noting that the gelding felt fresh and mentally prepared for the class even before they entered the ring. 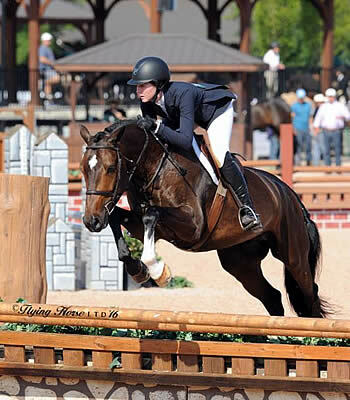 Hunter Holloway of Topeka, KS continued her momentum from Tryon Spring 6 into this week’s competition, capturing top honors in the $10,000 USHJA National Hunter Derby hosted at TIEC aboard Entourage, owned by Hays Investment Corp., with a total score of 173. Blythe Marano of Franklin, TN and Fondant, owned by Virginia Ingram, finished in second with a total score of 172.5, while Daniel Bedoya of Magnolia, TX and Playbook, owned by Monica Hanks, collected third place, receiving a 170.5. Holloway and Entourage received a score of 82 in the first round from the judges, before returning in the handy round to receive an impressive 91. Marano and Fondant sat atop the leaderboard after the first round, earning an 88 from the judges, but a score of 84.5 in the handy would ultimately drop them to second place. Holloway rode the handy round beautifully, piloting Entourage to a smooth and accurate round, showcasing his athleticism and attentiveness. She entered the round with a plan to take advantage of the numerous inside turns on course, which helped her to secure the win. Entourage began his derby career this past spring with Holloway guiding from the irons and he’s displayed a sense of consistency and bravery that has impressed everyone at Equi-Venture Farm. “He’s very easy and is a really straight forward horse. We’re hoping for a good summer season and success at indoors in the fall,” she smiled. Competition at TIEC continues Saturday with the $130,000 Ariat® Grand Prix CSI 3*. Gates open to the public at 6:00 p.m. and competition begins at 8:00 p.m. Parking and general admission are free! For more information on TIEC and to see a full list of weekly results, please visit www.tryon.com.